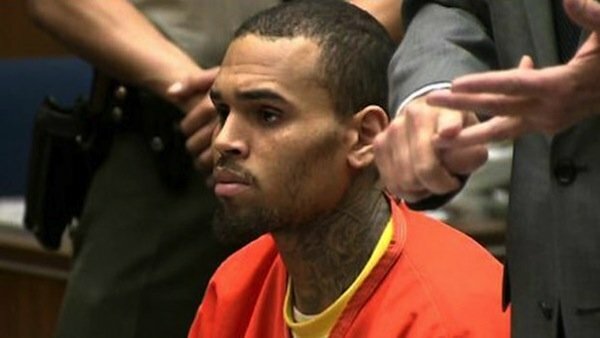 A Los Angeles judge has ordered Chris Brown to remain in jail for at least another week. Chris Brown will now spend his 25th birthday in jail as lawyers deal with two cases on both sides of the country. The singer has been in prison since March 14 after violating a court order relating to his assault of his ex-girlfriend Rihanna in 2009. Chris Brown had been sent to a rehabilitation centre and broke the terms of the court order when staff threw him out. Lawyers for the star had been trying to agree a deal over the probation issues on Thursday and will try again when Chris Brown is back in court on May 9. Chris Brown was led into the courtroom in Los Angeles in handcuffs on Thursday, having been transported from Washington DC for the short hearing with Superior Court Judge James R. Brandlin. The singer could face a number of punishments, including more jail time, if a judge decides he did violate the terms of his probation by getting arrested after a man was punched in October outside a hotel in Washington DC. Judge James R. Brandlin had ordered Chris Brown into rehab in December for anger management treatment, after revoking his probation. Chris Brown’s lawyer Mark Geragos said if a deal could not be reached by Tuesday, he would ask for the release of the singer. “I’m hopeful that we get it resolved, and we get it resolved quickly,” Mark Geragos said. Chris Brown’s assault trial has been delayed for the next few months, while his bodyguard appeals an assault conviction for the same incident. The singer did not speak during the hearing on Thursday but did smile at his mother. Chris Brown’s upcoming album, X, has been delayed several times and a new release date has not been set. Has Michelle Knight been reunited with her son?